Combinations of cancer drugs can be quickly and cheaply tested on tumour cells using a novel device developed by EMBL scientists. The research, reported in Nature Communications on June 22, marks the latest advancement in the field of personalised medicine. Using a microfluidic device that fits in the palm of your hand, scientists screened over 1100 treatment conditions (56 drug combinations x 20 replicates) on patient tumour cells. In the future, such tests could be used to inform clinicians on safe and effective combinations of cancer treatments. This research, incorporating fundamental science alongside clinical expertise at Aachen University Hospital, was led by EMBL group leader Christoph Merten and Julio Saez-Rodriguez, former group leader at EMBL-EBI and now Professor at Heidelberg University. Directly testing multiple cancer drugs on biopsies – parts of the tumour which have been taken from a patient – is a powerful way to discover which drugs work best, and for whom. This is because depending on the specific tumour characteristics, cancer therapies can be more effective in some people than others. However, large-scale patient specific drug screenings have so far been limited by the small biopsy size that can typically be obtained from patients. That is why in the current paper, the team developed a miniaturised device which can test more drugs on a limited number of cells. The research team initially tested 56 drug combinations on two different human cancer cell types grown in the lab. Drug combinations which killed both types of cancer cells were thought to be potentially toxic and thus unsafe for further testing. However, some drug combinations which targeted and killed only one type of cancer cell were found to be more effective than standard clinical therapies which only use one drug. These results were highly reproducible and could be validated in mouse models of human cancer. Subsequently, cells from four cancer patient biopsies were applied to the microfluidic device and different drug combinations were tested. "We found that each individual cancer responded best to a different combination of drugs, highlighting the urgent need for patient-specific therapies," says Federica Eduati, joint first author on the paper alongside Ramesh Utharala who designed and developed the microfluidic device. "Before we transfer this technology into the clinics, we need to repeat these experiments in larger-scale mouse studies to understand which types of cancer this technology works best in," says Christoph Merten. "Still, this is an exciting 'proof of principle' collaboration between scientists and clinicians, and we have shown that these tests can be run quickly and for less than $150 USD per patient." 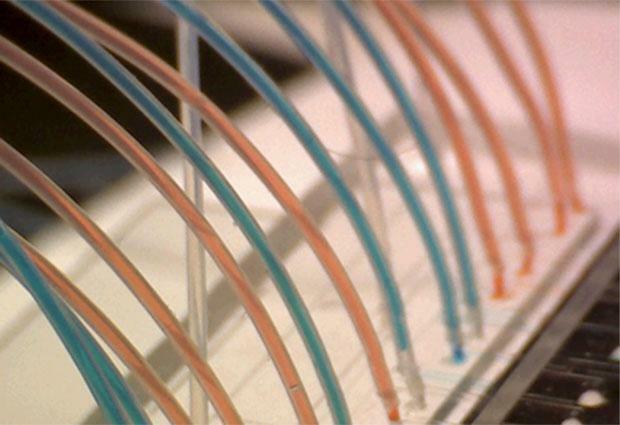 Microfluidic devices are plastic or glass 'chips' with microscopic wells and channels embedded within them. The current device relies on tiny programmable valves – usually used to print Braille – to open and close these channels in a highly controlled way. This means that tiny volumes of cells can be carefully pumped through the network of channels and be exposed to different drugs. Because of the small scale, hundreds of specific cell and drug mixtures can be combined in water droplets surrounded by oil and then sequentially ejected into long, thin plastic tubes, ready for analysis under the microscope. The collaborators were: Federica Eduati (Eindhoven University of Technology), Ramesh Utharala (EMBL), Dharanija Madhavan (EMBL), Ulf Peter Neumann (Aachen University Hospital), Thomas Longerich (University Hospital Heidelberg), Thorsten Cramer (Aachen University Hospital), Julio Saez-Rodriguez (Heidelberg University), and Christoph A. Merten (EMBL).